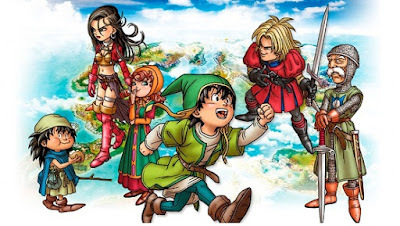 As the title of the game suggests, fragments are the main items that you have to collect in Dragon Quest VII: Fragments of the Forgotten Past. Once you have collected the rare fragment and completed the stone tabled in the temple of the Mysteries, then you can open a portal to the past to help its people and to bring them into the present. To track down the puzzle pieces, you should always talk to all the people whom you meet in principle. So get your important information on the locations of the fragments, sometimes you get them even paid directly. After a few hours of play you will also get two very useful tools that you search for the coveted items: Firstly, the radar that appears on the bottom of the screen next to the map flashes as soon as a fragment located near you. Also, in the menu on the "Info" tab - learn "Next Tablet Fragment", where there are tablet fragments that you can reach currently. You will find many useful items, search and explore new areas thoroughly, sometimes you’ll encounter expensive rare items. Always search common areas such as cabinets, vases or barrels. You can sell the excess items in stores and the money can directly re-invest in better equipment. However, in principle it is worth always to seek the weapons stores that can be found in almost every village - there you can get very powerful equipment. Incidentally your characters reach the best statuses if you endow them simultaneously with as much equipment: therefore, utilize all possibilities as armor, helmet, weapon, earrings, etc. Some tactics are particularly effective against the afterlife sprit / monsters. For example, to be very useful, use weapons that strike multiple enemies at once. Example: equip your protagonists with a boomerang to hit all enemies in one fell swoop. Nevertheless, Maribel with a whip still gets all your opponents who stand together in a group. Especially when you face many monsters at once, you can inflict damage quickly. In addition, you have an advantage if you know the specific strengths and weaknesses of your individual characters. Maribel has pretty low attack strength - so it makes sense to prefer to heal with the other characters or to give offensive spells for the best. Very useful against strong opponents, such as bosses, Maribels debuff which reduces defense of the target. This you can repeatedly apply, so as to increase the damage taken by your adversary significantly. You can use items to heal your characters in battle, but it must be readily available in the inventory of a character. So always keep a handful of different items in the bag. The most simple and very obvious strategy to level up your characters quickly is to fight as many monsters as you can. Each victory brings you valuable experience points (EP) that require for the next Level. If you are very lucky and hit on a metal slime and its modifications that brings you a particularly large number of EP - but for these monsters also have a very strong defense and quickly escape from a fight, if you don’t overcome in time. To increase the chance of defeating a metal slime and farm more EP, you can choose a vocation or a capability that promises a greater chance of a critical hit. Pay attention to simply the description of Kit objects, a vocation or an ability: There you will find an information, if you increase the chance to critically hit. For example: with the martial artist skill you have a higher chance to critically hit. Also helpful is to learn the last sword fighting technique of the warrior, as this provides a very high crit chance - on average a little more than every third attack is so critical. The most important rule is: Always speak with all people who you encounter. Since Dragon Quest VII is a very text intensive RPG, you learn as it goes on and you get often useful items - or at least an indication where there is a valuable item. Always speak with people and examine all corners for items and hints / clues. The Mini-medals can be found all over the game world in Dragon Quest VII - both in the past and in the present. To discover all, you have to search every corner meticulously, because the medals can be hidden everywhere. If you have collected enough items, you can take them to the Medal King and exchange them for valuable items. For the first reward you need at least 45 medals - in order to get the right powerful items, you need more Mini Medals. You can find (location of) the Medal King after you saved the fourth yellow island in the past. Visit now Gracos in the present, sail slightly to the southeast and along after the sea until you come to a place with some trees and hills. There you leave the ship and walk west until you encounter a castle where you can find the Medal King. When exploring the dungeons, mainly logical approach is required. The construction is to start usually quite confusing, but always follow a slightly inscrutable logic - once you have recognized this the Dungeons no longer like a confusing maze act. It is important that you always scan all corners and transitions for voluble items or money. Take as many EP as you can from each dungeon, it is of course useful to defeat all the monsters that you run into. However, usually a powerful boss is waiting for you at the end, whom you must defeat - fill your LP and magic points (MP) before the fight. For the boss battles your characters should be in top shape. The classes named in Dragon Quest VII vocations, you can change on the third blue island in the Restructured Abbey. Depending on the vocation to change the status values of your characters - a warrior for example, has a higher base attack as a thief. In addition, all appeals have their own special skills, for example: you engage in more water attacks as a sailor. Substitute your vocation; you will retain these skills if they come from a standard appeal. Once you have completed a standard appeal by disputed battles a certain number, it becomes an advanced vocation. This you can then in turn combine to create very powerful vocations.